The Signature Sleep Contour 8 Inch Reversible Independently Encased Coil Mattress (phew! That’s a mouthful!) is the 2nd most reviewed budget mattress on Amazon, with over 8,600 customer reviews! (By “Budget Mattress” I mean a queen size is generally under $500.) Does this make it the 2nd most popular mattress on Amazon? Well, that's hard to say, but I slept on it for 3 nights (plus several naps) so I'll give you my impressions! Watch my video review on YouTube, or read on for more details! Under the cover, we find the top comfort layer -- 1.6 inches of foam. Since it’s a reversible mattress, the comfort layer is the same on both sides. It’s not a memory foam feel, it’s more like a moderately dense poly foam -- somewhat responsive. In between the dual comfort layers are independently encased pocketed coil springs. These are sometimes known as Marshall Coils. The Amazon listing doesn’t say how tall the coils are, but we can just do the math to figure it out = 8.0 - 1.6 - 1.6 = 4.8 inch tall coils. The overall composition leads to a mattress that feels somewhat firm and quite a bit bouncy, but not too much of either. Firmness is really subjective, but if you forced my hand, I'd say this mattress comes in at about 6 to 7 on the firmness scale, where 10 is the most firm. In my humble opinion, this is the ideal range. Somewhat bouncy, but not too much! This is not an expensive mattress. In life, the old axiom of "you get what you pay for" generally holds true. But with that in mind, I would describe it as “pretty good.” I actually liked it better than the Zinus Green Tea Mattress (see my review of that mattress here). It must be said that because of the mattress’ makeup, the motion transfer is pretty significant. Couples may have a hard time on this one. When I laid on it with my wife, I felt her move quite a lot. This would be a good choice for a solo sleeper. In my ratings below, you are going to see that I rated some categories well, and some non-so well. Please understand that I don’t rate mattresses “on a curve” -- I give you my raw rating, and figure you’re smart enough to do the “cost vs. quality” calculation in your head. With all of that said, you're probably wondering . . . There were no major obvious flaws (no rips, unattached items, etc) on one hand, so that would be a good rating. On the other hand, it’s a plain Jane. Very basic, and feels kind of underwhelming. The box is really plain but that's no big deal. As for the cover itself, it's nothing to write home about, but it's fine. For all intents and purposes, no noise. If I’m pushing real hard and listening, I can hear the coils. Not an issue unless you have Superman level hearing. Very little smell at first, and just the standard “new mattress smell.” With 3-4 days, the smell dissipated completely. That makes sense, since it’s only about 40% - 50% foam, with springs in the middle. This likely helps with cooling, too. It feels pretty nice for that initial contact. The style of the cover, although basic, is inviting. The motion transfer is pretty bad. Just watch the video for a demonstration. This is a fairly bouncy mattress (duh). While I like a proper amount of bounce, a great mattress will have the bounce but still have layers to dissipate the impact. This one doesn’t have those layers. "Support" does not mean the same thing as firmness. This gets into tricky-to-describe territory, but means things like keeping your spine in alignment; does the firmness feel even, as opposed to lumpy or firm in spots without being firm in other spots? Do you sink in too much and "overcome" the top couple inches? This is always subjective. I am a back sleeper primarily but also sleep on my side some. The Signature Sleep Contour feels like it comes up to meet you almost just as well as a $1,000 mattress would. In my sleep trial, there was no place where I didn’t feel supported. That was the biggest pleasant surprise of them all! The support rates at 4.5 out of 5.0! I would describe the pressure point relief as average. I’ve had worse, I’ve had better. 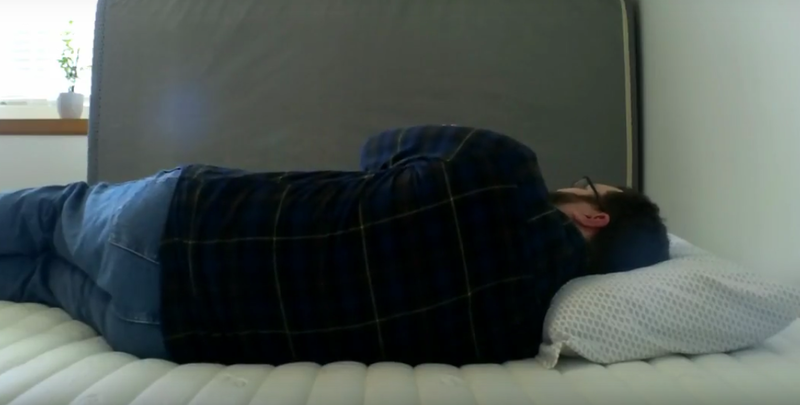 This mattress is good for side sleepers or back sleepers (I never sleep on my stomach, so can’t really comment on that), but likely a little bit better for back sleepers. I say this because it doesn’t have any memory-foam feel to it. Ideally, this mattress would be a little bit thicker (You can buy a 10” variety -- it raises the price quite a bit, but if you’re mainly a side sleeper, that may be worth it!) with more to the comfort layer than 1.6 inches on each side. This is something where body type makes a big difference. If you have a pretty average frame, you may not notice. If you have really bony hips and sleep on your side, that could be a problem. 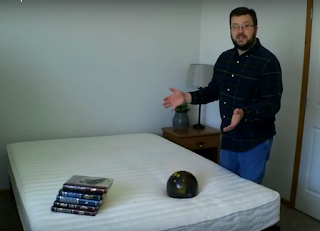 Conformity is the idea that the mattress is even -- without lumps -- and is locally conforming to your body without it being a global conformity (see video for details). The mattress did fairly well here, at least relative to everything else. The corners didn't quite conform to the cover, but came close. Here’s another category that I was pleasantly surprised by. You may know I love Hybrid mattresses (part foam, part coil) -- which this one “kinda” is (although it’s more of a innerspring mattress with a small comfort layer). I thought since it was so inexpensive there would not be much conformity, but that little 1.6 inches of foam does great for what it is! I slept nicely on it, all things considered. I would be a bit concerned about the foam giving out after 2-3 years (see comments below on the Warranty). In full disclosure, I didn't interact with customer service at all (I ordered it online and never spoke with any humans and never had to email anyone). I had no issues with the delivery, it came in the usual 2-day time frame. So, I had to rely on online opinions and Amazon reviews. I see a lot of satisfied people, and a few very angry people. That's not too uncommon. I unfortunately don’t see a lot of seller responses trying to make people happy. I also lose some confidence in the fact that there is apparently conflicting warranty information (see below). So, all I can say is “I don’t know” on customer service, and if I get comments about people with good experiences for exchanges, returns, etc., I'll be happy to raise that later. Shipping is free via Amazon; it would come via UPS or FedEx. My purchase was on Amazon, and since I'm a prime member, it arrived 2 days after my order via UPS. This is a very confusing warranty. I can say it's "at least" a 1 year warranty. It will perhaps protect against abject, obvious manufacturing defects (like if a spring is poking through the side), but other than that, a 1-year warranty is only a touch better than no warranty at all. Having said that, it’s cheap enough that you can legitimately buy a new one every 2-3 years and come out all right. I’ve seen a few people say they’d rather buy a new $200-300 mattress every other year than get a $700-1000 mattress every 7 years. If you feel that way, you may want to go with this one! Now . . . at the time I bought this, there were two different links to warranty pages on Amazon's product listing . . . and they have conflicting info. One place only refers to the standard 1-year warranty. The other link states it has a 2-year “full” warranty, and a 10-year prorated warranty. This isn’t spectacular, but it’s a bit better. Also, the 2nd link doesn’t specify how much of a sag is covered. 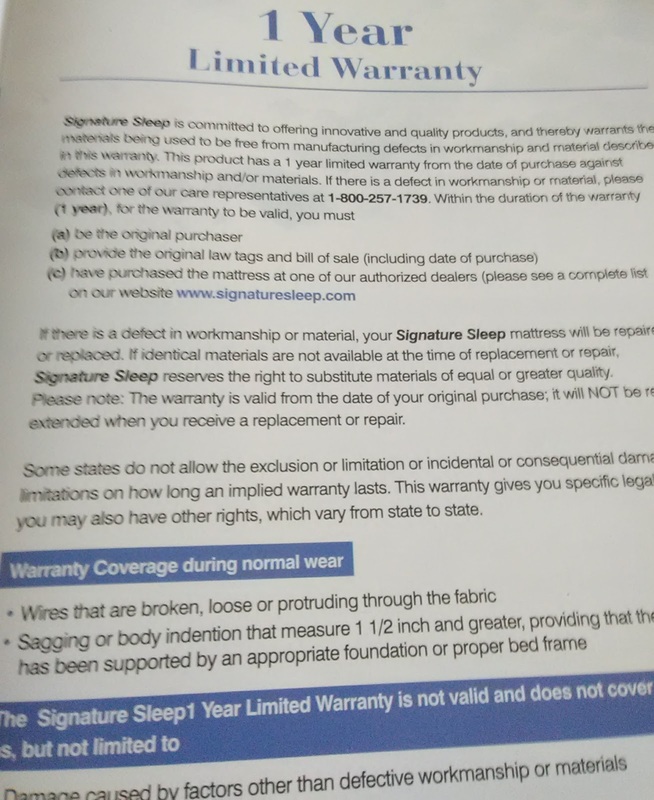 The material that came with the mattress only speaks of a 1 year warranty. 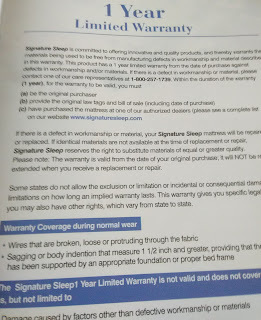 The manufacturer's warranty site speaks of a 1-year warranty on all products, and the 10-year prorated warranty on the Signature Sleep products, and refers to protections against sags of 1.5 inches or more. Which is right? I guess I have to assume the lesser until I'm shown otherwise. I don't love the fact that there is conflicting info, but again, that's likely not why you would buy an inexpensive mattress. As you likely know, on Amazon you can return almost anything. I've seen a few reviews from people who returned a mattress. You have to buy a very large mattress box (you're not getting it back in the original box!) and then send it back the "regular way" with a pre-paid label. You will have to notify UPS or FedEx it's a large item, then arrange pick-up. Some places I've seen have said they will reimburse you for the special box, others said they won't, so I'm not sure on that. Obviously, most people just give up and don't bother. This has to be done within 30 days. If you buy via the manufacturer, you may have to pay a shipping return fee of up to $75. Prices can - and do - change frequently, so please see the widget below for the current price of a queen (other sizes are available). If you decide to try out this mattress through Amazon, I would really appreciate it if you use one of the links on this page, as it helps out my blog and YouTube channel just a bit! You can also buy it on the manufacturer's web site (though this was a bit more expensive last I looked), and there may be other options as well. Available in these sizes: Twin, Full, Queen, and King. A 10" variety is available as well for an additional amount. I paid full price for my Signature Sleep Contour mattress. Some links on this blog are considered to be "affiliate links" (such as the links to products through Amazon) and I am paid a referral fee if you click one of these links and subsequently make a purchase. This costs you nothing. All opinions are my personal reviews and preferences, and do not represent the opinion of any particular company. Thanks for your consideration.